TV personality Barbara Kelly, known for her appearances on quiz show What's My Line, has died aged 82. 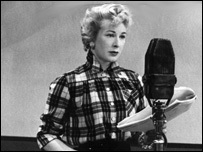 Born in Canada, she made her UK TV debut in 1951's An Evening at Home with Bernard Braden And Barbara Kelly, where her co-star was her real-life husband. The couple appeared together in further BBC series, including the sophisticated sitcom B-and-B, before Kelly set up a showbusiness consultancy. She died of cancer in London surrounded by her family, said her grandson. Kelly and Braden married in Canada in 1942, and the couple moved to the UK seven years later. Braden, who had a background in radio, soon found success on the BBC with the light-hearted variety show Breakfast with Braden. In 1950, the programme graduated to a later time slot, where it gained a new title - Bedtime with Braden - and regular appearances from Kelly. The pair soon made their TV debut on An Evening at Home with... where Kelly got equal billing with her husband. The off-beat sitcom invited viewers to spend informal evenings at home with the couple and their regularly visiting neighbours - but it only lasted for one series. 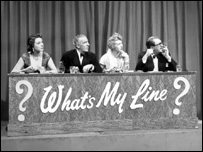 Kelly continued to appear in her husband's shows throughout the 1950s and '60s, but was most often seen as a panellist on What's My Line? Alongside other regulars such as David Nixon, Gilbert Harding and Lady Isobel Barnett, Kelly's role was to guess the occupation of members of the public. The show, which ran from 1951-1963, was immensely popular and made household names of its panellists. The show's format was later revived by ITV in the 1980s. Kelly teamed up with her husband again in 1968 for B-and-B, another domestic sitcom which this time featured their daughter, Kim. The show, which began life on the Comedy Playhouse strand, dealt with challenging social issues such as drug-taking and divorce. But Kelly gradually stepped out of the limelight and later established a showbusiness agency representing celebrities such as Joan Collins, Barbara Windsor and Sir John Harvey-Jones. She also launched a consultancy, Lion's Share, in 2000 which employed celebrities to train corporate bosses in public speaking. Bernard Braden died in 1993 following a series of strokes, and Kelly also lost her son, Christopher, to cancer. The actress was being treated in a Marie Curie home in Hampstead, London, when she died. She is survived by daughter Kim, six grandchildren and four great-grandchildren.